After a summer holiday where she spent the entire time hiding her body, Barbara vowed to do something about her weight. 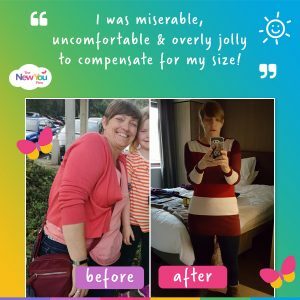 Suffering from a thyroid condition meant losing weight was always hard… until she found The New You Plan. Here, Barbara shares how she has lost 38lbs, which has seen her health dramatically improve! Barbara, when did you start The New You Plan? 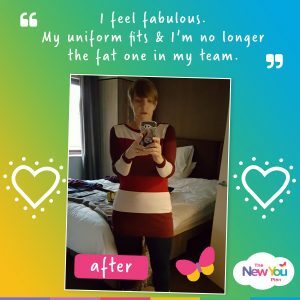 I started the plan on the 1st of August after a particularly miserable holiday where I avoided the swimming pool like the plague, and almost got fully dressed to walk to the toilets so that no one could see how big my belly, bum and thighs were. When I started, I weighted 14 stone and was wearing a size 16, which if I’m honest, was very tight. Before I started, I was completely miserable, uncomfortable and overly jolly to compensate for my size. I’d tried numerous different ways to lose weight but I have thyroid problems so losing weight seemed so much harder and slower for me. I said before about my miserable holiday. I cannot express just how awful it was. I was mortified by just how big I had become and that was my trigger point. I saw an advert for a 10 day bundle and I kept thinking about it but never did anything about ordering it. But then, the minute I got home from THAT holiday, I went on the internet and ordered my first 10 days worth of packs. I was so excited. I actually felt from the start that this was going to be so different from anything I had ever done before. My target initially was to get to 12 stone. 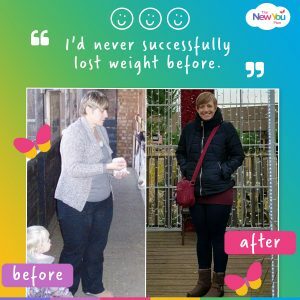 I’d never successfully lost weight before so two stone seemed like a huge mountain to me. But when I saw how easy it was to reach 12 stone, I carried on. I enjoyed the plan, I love the food and I am inherently lazy and not a natural cook so the ease of the plan definitely suited me. So I carried on until where I am now. I am happy to stay as I am for a while, but I would like to get to 10 and a half stone, so I’ll be back on plan soon. Oh WOW, where do I start? My confidence has grown so much, I feel fabulous, my uniform fits and I’m no longer the fat one in my team. I just feel like a completely different person, probably due to the fact that my ulcerative colitis has improved beyond measure. I am now no longer confined to my bathroom all the time, which was an unwelcome side effect of it before. Going swimming at Centre Parcs in December and moving between the pools in just a costume, with no towel wrapped around my body… just me, flesh and all! 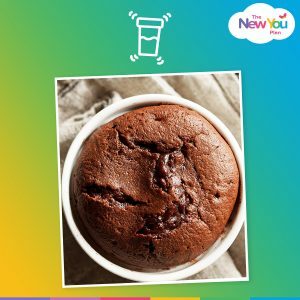 What are your favourite New You meals? Without a doubt, the Chocolate Brownies. True decadence for a previous chocoholic! Name one other diet that you can eat chocolate everyday AND lose weight! I love the Crisps too – they’re the perfect guilt-free snack. Just try it! And believe! If I can do it then anyone can! ← Magical New Me: How To Set Yourself Up For A Magical Day!